Are you asking yourself the question, "I want to start designing and creating applications that leverage JBoss BPM and I’m looking for an all-in-one guide. Do you have a suggestion?" I have just the book for you. 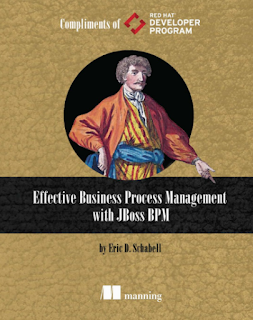 Effective Business Process Management with JBoss BPM is a book for developers, process analysts and architects who want to leverage JBoss BPM in their application development and design. No prior experience with BPM is required. Business environments are changing faster than ever. Organizations are constantly being tested in the markets they operate in by shifting expectations of their customers, and by competitors looking to provide better value at a lower cost. BPM, at its core, is about identifying and capturing an organization’s processes, in order to create repeatable, measurable, and consistent execution of goals – to drive the business forward! It’s about Improving efficiency and Effective Business Process Management with JBoss BPM teaches you the ins and outs of JBoss BPM Suite – the leading open-source product that supports rules, events and processes from design to runtime. You will learn how to implement real processes by automating tasks, designing data models, creating business rules, and managing running process. Start learning JBoss BPM Suite from start to finish today. 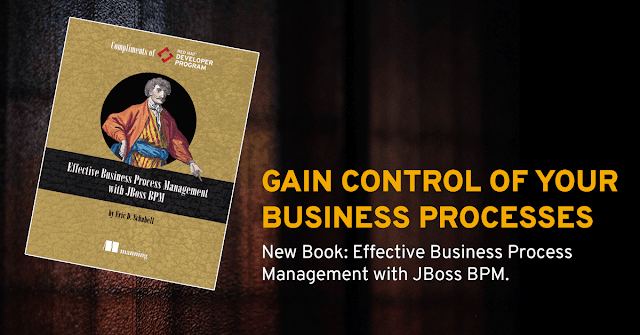 In Effective Business Process Management with JBoss BPM you will learn all you need to know to start using JBoss BPM and leveraging its many advantages for your business or organization. You will go from an intro to using JBoss BPM for advanced topics, and your learning experience will be guided by clear diagrams and images, illuminating explanations, thought- provoking examples, and lots of hands-on exercises.